"More than your eyes have ever seen!" 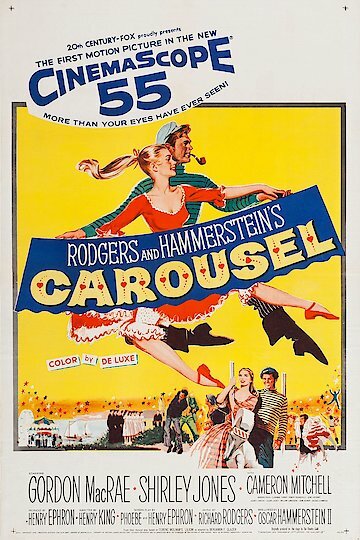 "Carousel" is a Rodgers and Hammerstein musical about the afterlife of carnival carousel barker Billy Bigelow. Half the movie is about Billy Bigelow's relationship with Julie Jordan in a small Maine fishing town, as Billy tells the Starkeeper. Every newly deceased person has the chance to go back down to Earth and visit for one day. Fifteen years later, Billy wants to go down to Earth to visit his daughter, Louise. Billy is more determined to go back down to Earth when he learns his daughter is unhappy. The starkeeper lets Billy go back down to Earth to help Louise. Carousel is currently available to watch and stream, buy on demand at Amazon, Vudu, iTunes online.